1. A checkout operator in a supermarket scans a product barcode as the customer passes through the checkouts. The price will be automatically displayed and as more products are checked out the total cost will be calculated. This means the checkout operator does not need to manually type in the price of each product. This makes the checkout procedure less time consuming and it is less likely that mistakes will happen. 2. As products are scanned at the checkout, the supermarket computer system will automatically determine whether more products need ordering so that replacements are placed back on the shelves. This saves time and manpower as it does not require an employee to constantly check the shelves or to manually order replacement products. Stock control is much more efficient as a result of the introduction of barcodes. 3. In the airline industry barcodes allow airlines and their customers to keep track of luggage. As a customer checks in at the airline desk each piece of luggage is given a barcode label. The automated system ensures that each piece of luggage is scanned and then placed on the correct plane. If bags are lost anywhere in the world, they can be located through the barcoding software. For instance, if your luggage is left in Kathmandu, Nepal - when you arrive in London and find your bags are missing the information desk should be able to locate the bags almost immediately - by accessing the airline barcoding system. This is also useful if your luggage is placed on the wrong plane and ends up thousands of miles away. Barcodes are usually overlooked by the customer. They appear boring and are rarely part of the design work for the package. The two examples below where taken from the packaging for tea. Diagram ‘A’ shows the normal way of displaying a barcode, black and white strips and numbers. Diagram ‘B’ shows a more imaginative way of displaying the same barcode as it incorporates graphics/images relating the product, in this case tea leafs. Do you think diagram ‘B’ is a more imaginative and interesting way of presenting barcodes? The barcode shown opposite could be used on the packaging of mobile phones. Adding an image or symbol does not alter the barcode at all, it can still be scanned at the checkout. 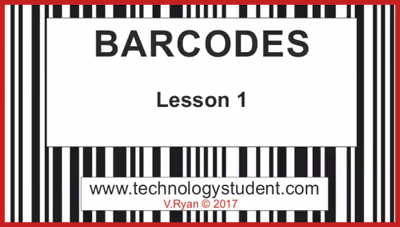 Designs can be added to barcodes but only if they do not interfere with the barcode lines and numbers. What do think of the layout of this barcode? This barcode has been designed for a florist. 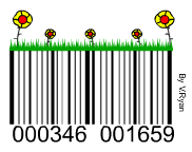 Grass and wild flowers have been added to the basic barcode so that it fits in with the shop theme. The barcode layout shown below has been designed for the packaging of a toy / model car. The barcode shape has been altered slightly but there is enough to scan. The barcode appears from the exhaust and the numbers are in place below it.